Limassol, 12th May 2018. On Saturday 12th May 2018, Limassol Theatre Arts School (LTAS) held their 8th Annual Talent Show with great success. Limassol’s own stage school for kids once again gave talented young performers, singers, dancers, musicians and entertainers the opportunity to showcase their skills. Organised into three age categories, the competition was fierce! Limassol, 20th May 2017. On Saturday 20th May 2017, Limassol Theatre Arts School (LTAS) held their 7th Annual Talent Show with great success. Limassol’s own stage school for kids once again gave talented young performers, singers, dancers, musicians and entertainers the opportunity to showcase their skills. Organised into three age categories, the competition was fierce! Limassol, 2nd Dec 2016. Our talented LTAS Performance Group entertained the Ambassador of the United States of America to the Republic of Cyprus last night, 2nd December 2016, at L'ONDA hotel. 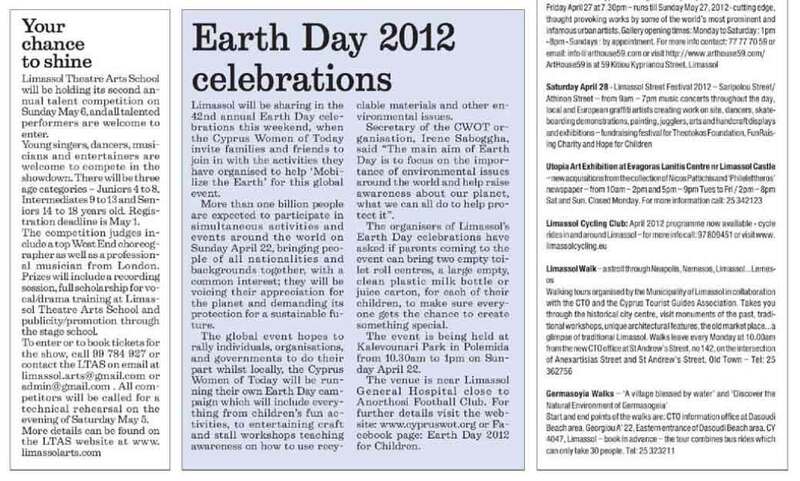 Limassol, 16th April 2016. On Saturday 16th April 2016, Limassol Theatre Arts School (LTAS) held their 6th Annual Talent Show with great success. Limassol’s own stage school for kids gave talented young singers, dancers, musicians and entertainers the opportunity to showcase their skills in a fierce competition of all performing disciplines. 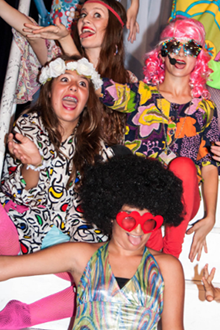 This performing extravaganza, was organized into three age categories (juniors, intermediates and seniors). The Limassol Theatre Arts School (LTAS) will present its annual talent show on Saturday, bringing the talents of children to stage. The school is also arranging a musical theatre workshop with West End choreographer Damian Jackson to take place on Sunday to give children who are interested in the arts a running start to what could be a great career, and more advanced children, a chance to learn from someone with a world of experience. Well known Cypriot designer participating in a talent competition for the first time in his career. Limassol, 20th Feb 2016. 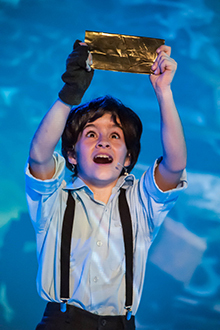 You won’t need a Willy Wonka style golden ticket to see a great musical performance on Thursday, but a love of chocolate and all things sweet is advised as the Limassol Theatre Arts School (LTAS) will be bringing us the West End musical theatre production of Charlie and the Chocolate Factory. Limassol, 8th Dec 2015. We all know that there are just some traditional plays that come around in December , but one about a mischievous little boy who brings winter and nips at our noses isn’t always on the list, probably because parents don’t want their children to get any ideas and start causing some mayhem of their own. Limassol, 27th Oct 2015. With a live radio broadcast from PlusSea, a raffle,and a free-of-charge party at the St Raphael – featuring lots of child-friendly entertainment from local organisations such as the Limassol Theatre Arts School, Rainborama, Wonder Dough, Bricks 4 Kidz and Little Einsteins – the Teddy Bear Walk is all set to highlight the benefits of philanthropy to the next generation. 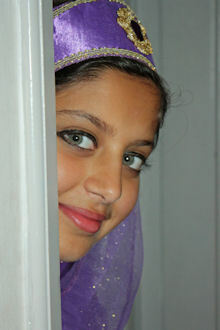 The Ninth of May (Victory Day) became a triumph for the many talented children in Cyprus. 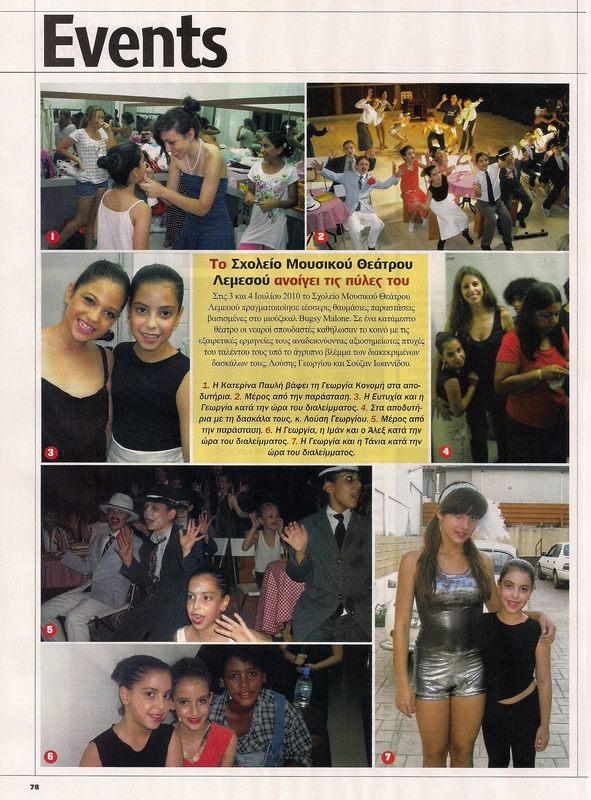 Young stars performed at the Annual Open Talent Show organized by Limassol Theatre Arts School (LTAS). The fifth competition has been attended by a record number of participants – 81! Limassol, 18th May 2015. 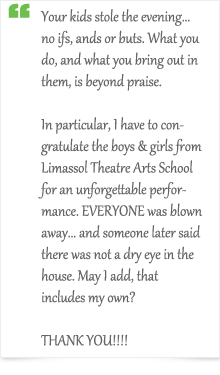 On Saturday 9th May 2015, Limassol Theatre Arts School (LTAS) held their 5th Annual Talent Show with great success. Limassol’s own stage school for kids gave young singers, dancers, musicians and entertainers the opportunity to showcase their talents in a fierce competition organized into three age categories (juniors, intermediates and seniors). Limassol, 7th May 2015. You might just be able to catch some of this new talent on Saturday during the 5th annual open talent competition at the Limassol Theatre Arts School (L T AS). But acting isn’t the whole story (just in case our introduction confused you), those involved will be singing, dancing, and making music to entertain us to the max and have the chance to see what it is like to be part of a live performance. Limassol, 25th February 2015. With snow falling all around Cyprus last Thursday , some of us surely starting singing ‘Do Y ou Want to Build a Snowman’ or started to hit some high notes with ‘Let It Go, ’; this is how much the Disney animated comedy adventure Frozen has become a part of our culture! Limassol, 13th February 2015. 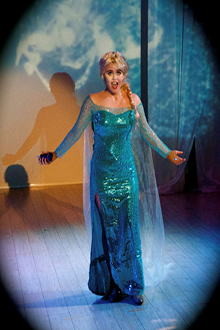 For the ‘First Time in Forever’, LTAS Stage School is bringing you a premiere performance of Disney’s stunning comedy adventure ‘Frozen’. Join the well known and loveable characters as they embark on their epic journey, meeting mystical trolls and a hilarious snowman on their way to save their kingdom. Limassol, 12th May 2014. 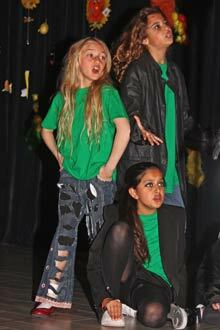 On Saturday 10th May 2014, Limassol Theatre Arts School (LTAS) held their 4th Annual Talent Show with great success. Limassol’s own stage school for kids gave young singers, dancers, musicians and entertainers the opportunity to showcase their talents in a fierce competition organized into three age categories (juniors, intermediates and seniors). The Limassol Theatre Arts School held its third annual talent show recently, enabling 62 young acts in junior, intermediates and senior age ranges to showcase their talents in a fiercely contested competition. 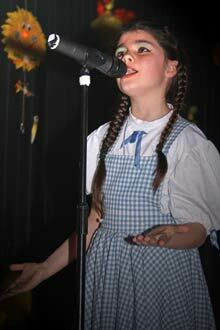 On Saturday 20th April 2013, Limassol Theatre Arts School (LTAS) held their 3rd Annual Talent Show with great success. Limassol's own stage school for kids gave young singers, dancers, musicians and entertainers the opportunity to showcase their talents in a fierce competition organised into three age categories (juniors, intermediates and seniors). All three judges were flown over from the UK. Talent. According to Simon Cowell, you've either got it or you haven't. From The X Factor to Britain's Got Talent the public have been gleefully tuning into the spate of talent shows that have graced our airwaves in recent years. Who could forget Paul Potts, the shy mobile phone salesman from Wales who brought Britain to its knees with his rendition of 'Nessun Dorma', or church chorister Susan Boyle, who rocked the world with her hauntingly beautiful version of 'I Dreamed A Dream'? Limassol Theatre Arts School is preparing to host its third annual talent show later this month. The town's successful 'stage school for kids' is encouraging aspiring young singers, dancers, musicians and entertainers to perform in a competition showdown, which will be judged by a panel of professionals. Limassol Theatre Arts School (LTAS) is taking a magical carpet this weekend- and everyone's invited. Back by popular demand, the LTAS group who brought the highly praised Beauty and the Beast is presenting Aladdin for its big annual performance. Time for a new story folks, and actually it is not only a new story – it is an official invitation to Art: to Limassol Theatre Arts School (LTAS), on 23rd and 24th of February 2013 at 15:00 and 18:30. Με παιδιά και χαρούμενες φωνές πλημμύρισε την Κυριακή ο Ζωολογικός Κήπος της Λεμεσού, με τη διοργάνωση της Παιδικής Γιορτής η οποία, έδωσε την ευκαιρία στα παιδιά να έλθουν σε επαφή τόσο με τα διάφορα ζώα που φιλοξενούνται όσο και με τους ανθρώπους που είναι υπεύθυνοι για την περιποίηση τους αλλά και την καθαριότητα του χώρου. Την Κυριακή 6 Μαΐου 2012, η Σχολή Μουσικού Θεάτρου Λεμεσού (Limassol Theatre Arts School) πραγματοποίησε τον 2ο ετήσιο διαγωνισμό παιδικού ταλέντου με μεγάλη επιτυχία. Μέσω του διαγωνισμού δόθηκε η ευκαιρία σε νέους τραγουδιστές, χορευτές, μουσικούς καθώς και σε παιδιά με οποιαδήποτε άλλα καλλιτεχνικά ταλέντα να παρουσιάσουν τη δουλειά τους σε τρεις ηλικιακές κατηγορίες (κατηγορία 1: 4-8 ετών, κατηγορία 2: 9-13 ετών και κατηγορία 3: 14-18 ετών). Limassol Theatre Arts School 2nd Annual Talent Show. Limassol Theatre Arts School celebrated its 2nd annual talent show recently with a wealth of talented youngsters competing for the chance to shine and hopefully develop a career in the performing arts. 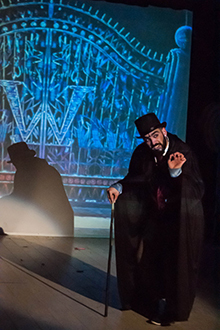 This year LTAS director, Lucy Georgiou, had in­vited celebrated West End choreographer. Ijy De Luca (Saturday Night Fever, Strictly Come Dancing UK. So you think you can Dance UK) and Joanne Davies. a professional violinist who regularly plays with international performers including Kanye West, Rhianna, Jay-Z, George Michael, Elite Goulding and Jamie Cullum, amongst many others, to judge the show and offer their professional advice and guidance to the young would be performers. Gregory Kerian, a professional musician here in Cyprus was the third judge. 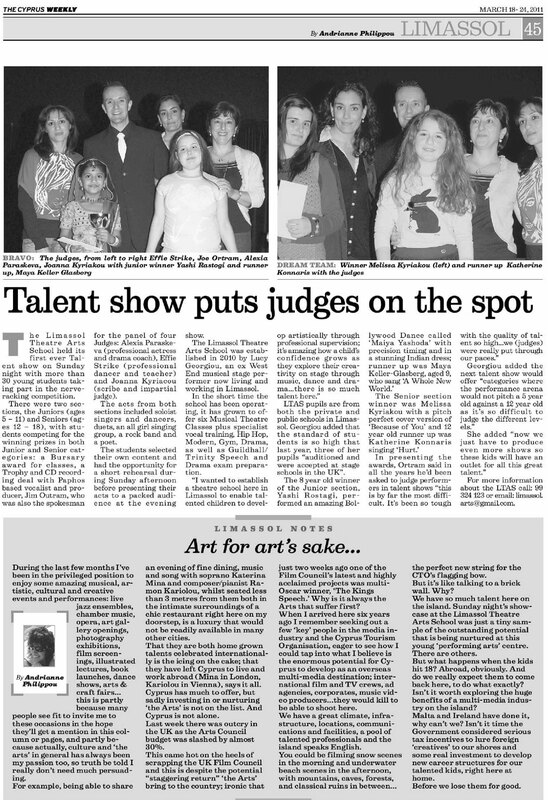 On Sunday 6th May 2012, Limassol Theatre Arts School (LTAS) held their 2nd Annual Talent Show with great success. Limassol's own stage school for kids gave young singers, dancers, musicians and entertainers the opportunity to showcase their talents in a fierce competition organized into three age categories (juniors, intermediates and seniors). Two of the three judges were flown over from London and the other one is a Cypriot based Professional Musician. *Ijy De Luca* ‐ a west end choreographer whose recent work includes choreography for west end show Saturday Night Fever TV shows 'Strictly Come Dancing' UK and 'So you think you can Dance?' UK. Limassol Theatre Arts School will be holding its 2nd annual talent competition on Sunday May 6 and all talented performers are welcome to enter. Young singers, dancers, musicians, and entertainers are welcome to compete in the showdown. There will be three age categories - Juniors 4 to 8, Intermediates 9 to 13 and Seniors 14 to 18 years old. Ένα από τα μεγαλύτερα μιούζικαλ όλων των εποχών ζωντάνεψε στη Σχολή Μουσικού Θεάτρου Λεμεσού (Limassol Theatre Arts School) σε μια έκρηξη θεατρικής μαγείας. Οι παραστάσεις δόθηκαν από σπουδαστές της Σχολής Μουσικού Θεάτρου Λεμεσού (Limassol Theatre Arts School) το Σάββατος 28 και την Κυριακή 29 Ιανουαρίου 2012 και κατάφεραν να συγκινήσουν μικρούς και μεγάλους. 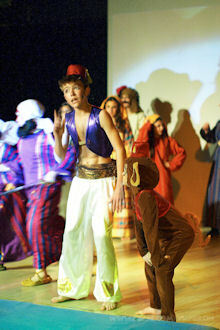 The much loved Walt Disney musical was performed by the LTAS students who ranged in age from 4 to 18 years. The growing popularity of the stage school continues and a wide variety of musical theatre, dance gymnastics, vocal and drama training and specialist audition preparation is provided for talented students looking to further their careers in vocational stage schools and the performing arts. Demand for Beauty and the Beast tickets last week saw Limassol Theatre Arts School staff being offered hundreds of euros for an €8 ticket. The sell out performances were in such demand that Lucy Georghiou, founder and co-director of the production along with Susan Ioannides, has scheduled two further shows this Sunday, February 12 to give those who missed out a second chance to see it. 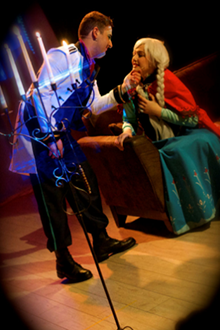 The much loved Walt Disney musical is performed by the LTAS students aged from 4 to 18 years. On Monday 27th June 2011, the music room at LTAS was turned into a sound booth where six students (Kate Pavli, Melissa Kyriakou, Artemis Georghiou, Katherine Konnaris, Iolanthe Georghiou and Maya Keller-Glasberg) each got the chance to record a song for a Compilation CD. The Limassol Theatre Arts School held its first ever Talent show on Sunday night with more than 30 young students taking part in the nerve -racking competition. There were two sections, the Juniors (5 - 11) and Seniors (12 - 18)with students competing for the winning prizes in both Junior and Senior categories: a Bursary award for classes, a Trophy and CD recording deal with Paphos based vocalist and producer Jim Outram. The size of a place need never be a limiting factor in how much talent is nurtured there. It isn't more true of any place than of Limassol. It is so relatively small but the rich cultural amalgam that you get to witness here through the year is comparable to the best cities in the world. Στις 3 και 4 Ιουλίου 2010 το Σχολείο μουσικού θεάτρου Λεμεσού πραγματοποίησε τέσσερις θαυμάσιες παραστάσεις βασισμένες στο μιουζικαλ Bugsy Malone. Σε ένα κατάμεστο θέατρο οι νεαροί σπουδαστές καθήλωσαν το κοινό με τις εξαιρετικές ερμηνείες τους αναδεικύοντας αξιοσημείωτες πτυχές του ταλέντου τους υπό το άγρυπνο βλέμμα των διακεκριμένων δασκάλων τους, Λούσης Γεωργίου και Σούζαν Ιωαννίδου. 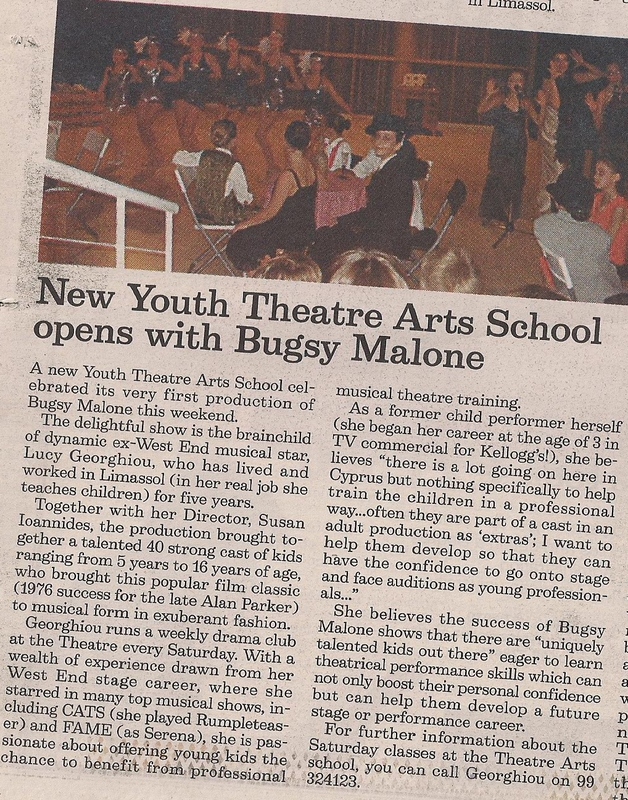 A new Youth Theatre Arts School celebrated its very first production of Bugsy Malone this weekend. 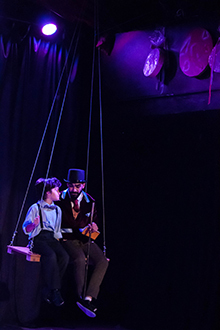 The delightful show is the brainchild of dynamic ex-West End musical star, Lucy Georghiou, show has lived and worked in Limassol (in her real job she teaches children) for five years.